Amid a Western standoff with Russia over sanctions and the Syrian crisis, ally China congratulated President Vladimir Putin after he was sworn in for a new term on Monday. At the Kremlin Palace Putin was sworn in for a new 6-year term on Monday. “The Chinese side believes that under the leadership of President Putin, Russia will keep making achievements in its nation building and social and economic development,” Foreign Ministry Spokesperson Geng Shuang told a routine press briefing. Chinese President Xi Jinping spoke to Putin after more than 70 per cent of voters backed him in a March 18 presidential election. China’s Foreign Minister said a “personal push by President Xi and President Putin” has boosted ties between the two nations. Beijing and Moscow “have exchanged views on major international and regional issues in a timely manner, kept close coordination within the framework of multilateral mechanisms, and made significant contributions to world peace and stability” Geng was quoted by Chinese agency Xinhua. Trade between BRICS allies China and Russia has increased about 30 per cent in the first quarter of 2018, according to Chinese officials. On Monday, Putin announced he was retaining Dmitri Medvedev as Prime Minster and Anton Siluanov as Finance Minister. 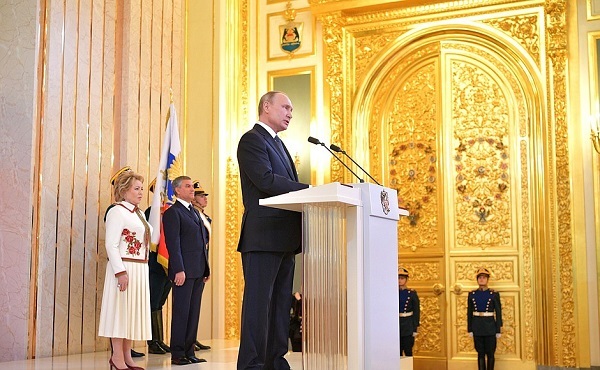 In a speech after the swearing-in ceremony, Putin said that Russia favours “equitable and mutual cooperation with all states in interest of peace”. “Russia faced a number of dark periods and challenges, and rose like a phoenix from the ashes every time, achieving heights that seemed unattainable to others,” Putin said.